FGW won't sell you a sandwich, you might choke! 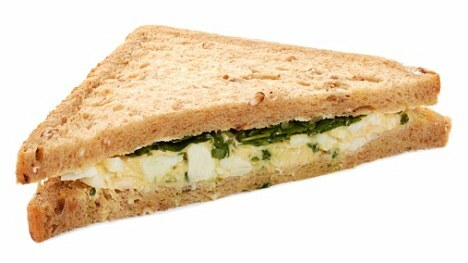 A train steward refused to sell a passenger an egg sandwich... because he might choke on it. Chris Haynes had gone to the buffet car after the crew announced that everyone on board would get a free soft drink as compensation for the train breaking down. After suffering the long delay and a lengthy queue to be served, Mr Haynes was understandably hungry. He saw some egg sandwiches on sale behind the bar that looked appetising, but when the 58-year-old came to order he was astonished to be told he couldn't buy one. Mr Haynes explained that he was not trying to get a free meal and was happy to pay, but the steward again told him that he could not sell him a sandwich. Recalling the bizarre exchange yesterday, Mr Haynes said: 'When I asked the man why not he said it was for health and safety reasons. The grandfather, who is about to emigrate to New Zealand to run a tour company, said he was astonished by the steward's reaction to his simple request. 'First Great Western were quite happy to give out free drinks but weren't prepared to sell egg sandwiches for health and safety reasons,' he added. Mr Haynes had been travelling back to London from a day at Newbury-Racecourse in Berkshire when his packed evening train came to a standstill less than half way into the journey. First Great Western run a special service to Newbury Racecourse on race days. The train last Saturday, carrying racegoers from the Hennessy Gold Cup at Newbury Races, eventually arrived at Paddington Station two and a quarter hours late. 'Everything was going well until we broke down somewhere around Reading,' Mr Haynes said. "Ive eaten sandwiches sold by train companies and by not selling the gentleman one they probably did him a great favour." "Hahahaha! It just gets worse.... what next, a pub can't sell you a pint of beer in case you drown?" "The mere price of railway food is enough to make anyone choke, not to mention the fares."